2016 was a historic year for Polamer Precision. We set new benchmarks in almost every department of the company including revenue and employee growth. Most importantly, we proved that we were capable of evolving from a development “job shop” to a global, 21st century aerospace manufacturing facility in a short time. Our customers took notice and this evolution led to the signing of three Long Term Agreements (LTAs) in 2016. These agreements are commitments from our customers which will allow us to have strong, healthy business for years to come thus allowing us to continually invest in resources, technology and employees. Hanwha Techwin: Also in October, we signed a contract to produce Diffuser Cases for Hanwha Techwin, a world leader in aerospace headquartered in Seoul, South Korea. This 10 year LTA will allow us to further invest in our complex 5-axis machining cells. 2017 is shaping up to be another productive year full of unprecedented growth. Our current performance and execution on critical hardware for Pratt & Whitney is creating both opportunity and stability. We are currently in negotiations with Pratt & Whitney on a third revision to our LTA which would further bolster our backlog. A strong backlog is key in creating opportunities for current employees, job security and increased profit sharing. We would like to thank every single employee at Polamer Precision. It is through your daily execution and ability to take on challenging tasks that have made us one of Pratt & Whitney’s most valued suppliers. The future is bright and we look forward to an exciting year ahead! As we enter the new year, it is a natural time to pause for both gratitude and reflection. Many of you have been with Polamer Precision for years and have seen the company grow tremendously. Over the years, you were able to exceed your goals and meet the challenges of prosperity. For those of us who have joined the company recently, you have welcomed us and generously shared your expertise, skills, and advice. I believe this has made us a stronger team and has kept us on the path to success. For this I am grateful. With a 50% increase in sales, this year has been exceptional. As a team we were able to deliver successfully on our contracts and continue to build a reputation for quality and innovation. Each and every contribution has been essential to our increased growth. I am really proud of the fact that as a company and individually as employees, we contributed to the community and shared our good fortune. Many organizations benefitted from our philanthropic efforts including the Connecticut Children’s Medical Center, the New Britain Friendship Center, and other local charities in New Britain and surrounding towns. I am amazed by the generosity of each and every one of you. We can all take pride in these contributions. 2017 will be filled with exciting opportunities largely due to the strong commitment, talent, and skills of our team. We look optimistically to the challenges the new year will bring. With an anticipated 100% increase in sales, we intend to add more than 10 million dollars in new equipment and 60 – 100 new employee positions in order to accommodate the production volume. I am confident we will welcome them with enthusiasm. It is important for us to move forward while holding on to the core values that have brought us to where we are today. I am proud to be a part of the Polamer Precision team and look forward to 2017! Supply Chain Management Review, a national publication dedicated to our industry, published an article highlighting our relationship to Pratt & Whitney. The focus was on how Polamer Precision went from supplier to partner by being integral in engineering and production through a collaborative effort. Federal officials from the White House and the Economic Development Administration toured our facility. The federal delegation was led by Jason Miller, Advisor to the President on Manufacturing, and Jay Williams, Assistant Secretary of Commerce. Polamer Precision was selected as a state-of-the-art aerospace manufacturing facility that can compete worldwide by using innovation & technology, smart energy upgrades, and LEAN practices. 2016 also saw the beginnings of another tradition: the Chief Chef Cook-off Cookout! Special thanks to CEO Chris Galik, VP Andrew Dulnik, and CFO Mario Gioco as well as all of the employees who came out to vote and eat! Our team has grown tremendously and we are thankful for each and everyone’s efforts to help us grow and reach our full potential. Long Term Agreements and sustained success continues to foster growth and the need for additional talent. Over 150 new school supplies were collected by Polamer Precision to the New Britain Friendship Center helping elementary school children start the year prepared! Thank you to all Polamer Precision employees who donated! In our effort to attract the best talent in the industry as well as increase revenue, Polamer Precision partcipated in one of the aerospace industry’s most prominent trades shows in Hartford, CT.
Hanwha Techwin a world leader in aerospace, headquartered in Seoul, South Korea, signs ten year LTA with Polamer Precision. Polamer Precision, in cooperation with Pratt & Whitney and the New Britain Board of Education, turned a common childhood pastime into a business simulation, helping to demystify aerospcace manufacturing among younger generations. The holiday season is one of excitement, togetherness and celebration. 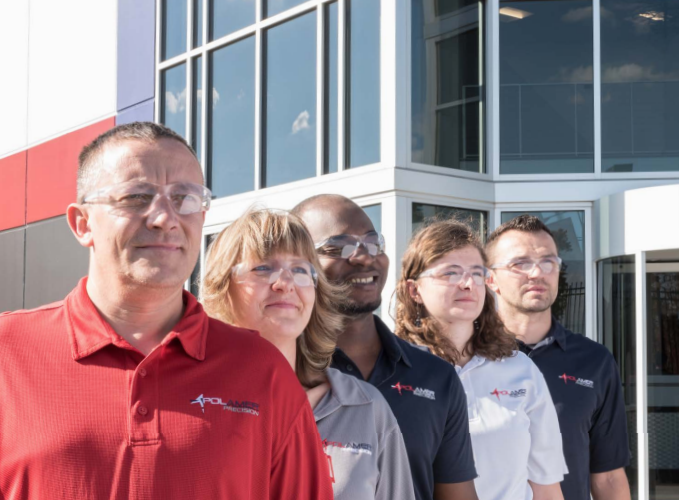 We are thankful for the wonderful family-like attitude shared by the entire Polamer Precision team. We look forward to being able to enjoy a little bit of down time and enjoy a meal together during this special, annual event. Congratulations to Darek Zadrozny, winner of our first ever Fitness Challenge! Many thanks to all of the Polamer Precision employees who participated in this year’s competition in an effort to make Polamer Precision a healthier work environment. Thanks to the generosity of Polamer Precision’s emplyees, children at the CCMC will have a brighter holiday season. We are greatly humbled by the outpouring of generosity from the entire staff.